Formerly Madras, Chennai is the capital of India’s Tamil Naidu region and the country’s fourth largest city. The lively city is so diverse in its offerings you might find yourself staying longer than expected if you have a bit of extra travel time to play with. Beaches are a big draw here, as are temples, historical sites, and some seriously good food. Ready to visit? Here’s everything you need to know for when you get there. There are a few options when it comes to getting into the city centre from the airport, and one of the quickest is by taking a prepaid taxi. You can book tickets from the counters in the arrival areas of the terminal buildings. Expect to pay INR 350 to 450 for the 30-minute trip. Autorickshaws are also widely available to get you into the city from the airport. Exercise your bargaining skills and try for INR 200, and try not to go above INR 300. There is also a public bus stop located outside the gates to the airport, but it is a bit of a dusty walk, which might not work if you’re carrying a large backpack or suitcase. Bus no. 18A operates between 5am and 10pm and you can expect to pay about INR 20 for the 45-minute trip. Bus no. 18B (INR 35) operates along the same route as 18A, but is air-conditioned, and generally less full. Travelling from the airport by train is also an option. From Tirusulam Railway Station you can get to the city (Egmore Station) every 20 to 30 minutes. The trip between the stations should take about 25 to 30 minutes and cost INR 12 (for second class — not recommended if you have baggage) or INR 100 (for first class). Chennai has a suburban train network consisting of four routes (the Chennai Beach–Tambaram/ Chengalpet is the most used line). The frequency of trains is generally good and it’s best to opt for a first class ticket during peak hours. Trains run several times hourly from 4am to midnight and cost INR 5 to 10. Metropolitan Transport Corporation (MTC) buses are another option for getting around Chennai. Buses also travel to areas that aren’t accessed by the suburban trains, but be prepared to jostle as buses can get pretty crowded at peak times. Cost varies according to what type of bus you take, with the cheapest being between INR 3 and 14 depending on how far you travel. Deluxe buses are double the regular fare, and if you want a bus with A/C, the price is around three times the regular fare. You can check routes and schedules on the MTC website. You can also get around the city via autorickshaws, but try to use the ones with metres (although this may be tough as many drivers refuse to use them). Approximate rates are INR 25 for around two kilometres and INR 12 for every kilometre after that. Kapaleeswarar Temple is devoted to the Hindu god, Shiva, and built in the Dravidian style of architecture. 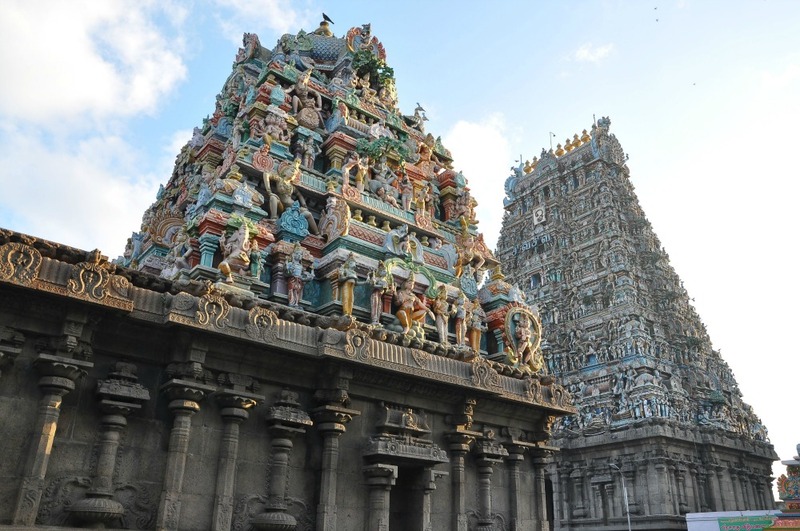 Located in Mylapore (a suburb of Chennai), the ornate temple dates back to the 7th century. The gopura (or gateway tower to the temple) is especially noteworthy as it’s covered in elaborate sculptures. It just wouldn’t feel right to offer a guide to Chennai without incorporating food. In this case, we’re talking dosas, those delicious South Indian crisp and savoury treats. These are a must if you’re in Chennai. There are countless places to stuff your face, but some of the best spots to fill up on dosas are Mami Tiffin Stall near the Kapalleshwarar Temple, Karpagambal Mess on East Mada Street, and ID, which has three locations in the city. Get out of the hustle and bustle of the city with a visit to peaceful Pulicat Lake Bird Sanctuary, home to over 100 species of birds including flamingos, egrets, herons, sandpipers, and many more. This is one of the most famous bird sanctuaries in India and the second largest brackish water ecosystem in the country (brackish water is where salt and freshwater mix). The tranquil atmosphere might be just what you need after a few days of busy city living. Beach lovers will be happy in Channai as there are many options for soaking up some sun on a pretty stretch of sand. Marina beach is the longest beach in India so you should have no problem finding space. The golden-sand beach is popular among both locals and tourists and you’ll find shops and food stalls with Indian snacks and ice cream. Another option is Thiruvanmiyur Beach, which tends to be less crowded than Marina Beach. If you get hungry, there are fish stalls serving up freshly caught seafood. Thyagaraya Nagar, popularly known as simply T. Nagar, is a popular shopping area in Chennai and one of the biggest shopping districts in India by revenue. Whatever you’re looking for — be it jewellery, fabrics, handicrafts, clothing, or food — you’re likely to find it here. Chennai Express, about one man’s journey (and love story) as he travels from Mumbai to Rameswaram, is a good movie to watch to get you in the mood for a trip to Chennai. Dhanush (born Venkatesh Prabhu) is an Indian singer, actor, director, and producer born and brought up in Chennai. Check out his singing chops here. Two books to add to your reading list before you hop a plane to Chennai include Madras: Its Yesterdays and Todays and Tomorrows by S. Muthiah and Madras Then Chennai Now by Nanditha Krishna and Tishani Doshi. To find out more about Chennai or to book a Chennai Urban Adventures tour, email us at info@chennaiurbanadventures.com. Looking to make the most of your time in Chennai? Hop on a tour! Our locally led city tours will show you the local side of life in Chennai. Get to the heart of Chennai’s local culture with a jam-packed morning of art, spirituality, and food! Visit an ancient temple, join in an early-morning Hindu ceremony, learn the mudras at a prestigious dance academy, and dig into a traditional south Indian breakfast — talk about the ultimate way to start your day!